The Patti Smith on Youth and Friendship podcast from the New York Public Library kept me company today while I chipped away at an enormous domestic chore that my husband and I have been working on for weeks. In this 2010 interview Patti Smith discusses her education, her early days in New York City, and her friendship with Robert Mapplethorpe. That was the year her memoir Just Kids was released. It’s a brilliant conversation but has left me feeling skinned and with a headache. Readers have begun to officially follow my blog now with this impulsive crashing into September I’ve done, vowing to write a post a day. The journalist Traci Lee was my student for a brief moment in high school, and I’ve been her groupie ever since. Her notes from a coffee shop is amazing and she did a post a day during August and I’ve jumped her train one hundred percent for September. The fact that your old high school writing teacher is copying you online is either going to be creepy or nice depending on several variables. I choose nice, obviously. but it’s probably up to Traci to decide. Which leads me to this moment when I must use this space to tuck myself back together because I don’t have time to wander about in a gobsmacked Patti Smith fog. It is Saturday and I am a teacher and this is the day for my household chores. Even from a very young age, Patti Smith loved William Blake’s poetry. She has been inspired by him her entire life. Listening to artists talk about their early literary influences makes me jealous. I had books I loved too but I second guessed myself even as a child and that often prevented me from delving in. At ten years old I loved Kahlil Gibran and the Bible but that was weird and so I dumped them as though they were unpopular friends and picked up the Wildfire and Sweet Dreams romances everyone else was reading instead. Patti Smith talks of Robert Mapplethorpe’s depth of confidence in his own work. The concept of utter confidence in one’s own work is a fascination. I see that kind of glory in several of the visual artists I love and know personally. I can’t think of a single writer I know over the age of eighteen who feels thus. Patti Smith made New York City sound juicy and real, just as I’d imagined it would be after watching Desperately Seeking Susan a million times when I was a teenager growing up in a California suburb. On the time/space continuum, a version of me slumps over a notebook scratching out poetry in a diner where I’ve spent my last dollar on coffee and a donut. 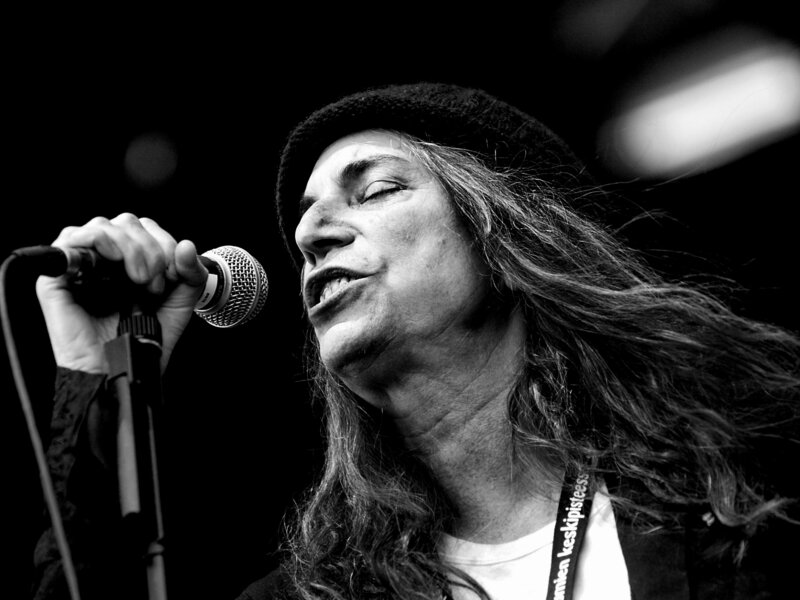 Patti Smith evoked Paul Cohelo’s The Alchemist and praised the notion of remaining enthusiastic about life regardless of what happens. This idea interests me so much more than the importance of being cool and bored and tired. Patti Smith is the coolest lady ever and she’s enthusiastic so no excuses. Ooh, I feel so good now! Thank you for the props and link, Maureen! Wonderful post! 🙂 I thought you might be interested in my graphic novel “The Poet and the Flea” (Volume 1) about the poet-painter William Blake: https://www.kickstarter.com/projects/868711984/the-poet-and-the-flea-ode-to-william-blake-volume Please check it out and help spread the word! Thank you so much! —G. E.